When Bad Things Happen To Good Laundry or Hey! There’s An Alpaca In My Dryer! Sean is a perfect husband in training. That is my goal as his mother — that he would grow up to be a good partner and helpmate to some lucky little girl. And by good partner, I mean a man who knows how to cook a few things and put his dirty underwear in the laundry basket without confusing the two. And really ladies, isn’t that all we want in a man? Okay, no. That’s not all we want, not even close. So far, Husbandry 101 is going well. Sean can crack eggs, make toast and imaginary soup. And every morning he makes his little bed in his own way, puts his jammies in the laundry basket, dresses himself in mostly matching clothes and then brings me a cup of coffee and the newspaper. Okay, I just made up that last part, but the rest? Pretty good, eh? Unfortunately, Sean is not yet a discriminating launderer. And here I will put the blame squarely on the Y chromosome, where it belongs. Someone else I know who lives in my house who also has a Y chromosome put someone’s brand new linen walking shorts in the dryer on high heat with the towels. And she wasn’t happy. At any rate, the other day, when Sean got up and dressed himself, he put his jammies in the laundry basket, but he also put his Pull Up in the laundry basket too. And I say unfortunately (I said unfortunately two paragraphs ago but understandably, you may have forgotten) because it was only after I was taking the clothes out of the washer and putting them in the dryer that I noticed all these odd little squishy balls of squishy stuff on everything. And at that time, I wondered what exactly is that squishy stuff? So it seemed well and good to me that this was a job for the dryer because the dryer has more time and patience than I do when it comes to picking a zillion little squishy balls of squishy stuff off a carload of wet laundry. So I just shoved everything in the dryer, made the sign of the cross, slammed the door shut, turned the dryer on and then ran away. When I came back later to retrieve my clothes from the dryer I found an alpaca in the lint trap. So, a little science lesson here: Those squishy little balls of squishy stuff in Pulls Ups? Itty bitty freeze dried alpacas. Just add water and heat. Thank you so much for posting this, you saved me a bunch of frustration. It is almost midnight and I was throwing a load of laundry in the dryer only to find a substance all over the clothes. The substance was a familiar substance but I couldn’t place it until I came across the pull-up that my 4 year old wears at night and must have left in his jammies. I thought I can’t possibly be the first to have done this and always go to the internet first before trying something myself. My first thought was to just put all the clothes in the dryer and see how it comes out but I was afraid I may wake up to a bigger mess or even a fire. So thank you for helping me get to bed without worrying about something else. God Bless you! I haven’t laughed this hard in a long long time. Tears. in. my. eyes. can’t. breathe. Wiping my screen now. Your warning should include***may inadvertantly spit on screen. Happy 4th! Alpaca Husbandry? I have found some weird stuff in my dryer, but never an alpaca! Seriously… the mishaps that take place in my laundry room can frazzle the last good nerve I have left. But when they happen to other people, I laugh until I snort. There’s a little something for you at my blog today. 🙂 Here’s the link. Oh dear! I washed a pull up a few months ago but I was stupid and tried to vacuum them out of the washer. Smart, huh? Do you know the “llama song”?? I’ll have to email you the link – great fun for your boy! I’m stopping by to say hello and note that I’ve written my last post on my blog. Yep, done that. I used the vacuum hose though 🙂 And now I’m very careful to check jammie bottoms. Ah….the squishy balls of pee. Yay. I’ve never laundered them myself, but someone in my household feels the need to attempt to throw diapers at (yes, I said at, not in) the trashcan from the other room, and I’ve had them explode and send little squishy fish-eggs of pee all over my kitchen. Good times abound. After once having to vacuum an entire shredded pack of cigarettes out of my dryer/lint screen holder thingee, I’ve learned to check any and all pockets before things go in the washer. Which is great, because I needed the laundry to take longer. Squishy Alpaca balls in the dryer! What a riot! Mix that with used shredded tissue and forgotten ‘chill pack’ from the camp backpack and you have a veritable Chex Party Mix of dryer fun! As an aside, on of those freezer chill packs actually was in my dryer and of course exploded. The insides look exactly like the little balls of goo from the inside of wet diaper. So – theoretically, could you freeze a wet diaper to keep your lunch cold?? You know, I had hair like that in Grade 10 (Sophmore year for the Americans). Pretty eyes she has. I’m impressed that he’s adept at cracking eggs! If I gave my four-year-old an egg, it would end up in the computer’s CD-ROM drive bay. And I’ll ignore the Y chromosome cracks. Mostly because I can’t refute them. That exact same thing happened to me! Luckily, I saw the pull up as I was putting everything in the dryer, and was able to rewash the load which also worked. As I have also found books and shoes in my boys’ laundry basket, I have learned to put items in the washer ONE AT A TIME! Ooh, just wait until the spinners (of wool) find out about this, they’ll be thrilled to know it, I’m sure! I laugh because it doesn’t get better as they grow unless you keep instructing them to take things our of their pockets. For the record, it’s best to put the Kleenex covered clothes in the dryer too. We believe in Husbandry Training too! Ours extends to cleaning the bathroom and vacuuming. I want my DIL to LOVE me later. But I bring you good tidings! You can train them to bring you coffee in bed! But only fill the cup half full unless you want to clean coffee from the floor later. Oh yes Mamasphere. I know of what you speak. One time I tried to shake the little squishy balls off the clothes before putting them in the dryer (big mistake) and then I had little squishy balls stuck to the walls, stuck to the floor, stuck to me which I then had to pick off and yes, they do not “pick off” — they just smear. So definitely, the dryer is the way to go. And? You’ll find a little alpaca blanket in your lint trap when you’re done! You mean it’s okay to put it all in the dryer? Knowing that lovely little tidbit of info would have saved me countless hours of clean up! Though once it hits the floor, there’s nothing you can do but get down on your hands and knees- sweeping only smears it around. I believe in pre-husband training as well. Each of my boys – ages 5, 5, 4 and 2 are learning how to tend to household things. What great husbands they will be! Each and every day Randy, my dear hubs, takes the boys for walks around the neighborhood! Each and every day they come home with some sort of flower – dandelion, lily, clover – you name it – just for ME! I am so very spoiled! The boys make their beds (to the best of their abilities) know how to dust window sills, know how to wipe a toilet down, know how to put laundry in a hamper and dry dishes. I should add here – the two year old is just beginning to learn to put things away. I really believe we should be working on these things as early as they can learn! I can relate to you about the pull ups in the washer/dryer! We have had this happen on several occasions! There is only one word to describe it – NASTY! 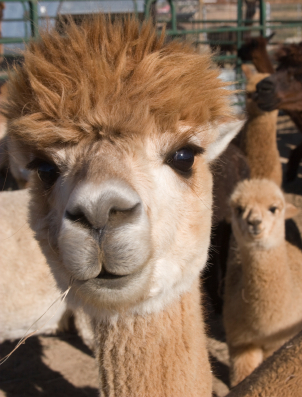 You crack me up about the alpaca! The sweet eyes of the Alpaca is what got me this time. Makes me want to go to the zoo. Oh, the stories my dryer could tell! I’ve been right where you are and then some. How funny! Fortunately, we’ve only washed Pablo and some Legos by mistake around here (actually, in hindsight, both were probably for the best)! I’ve done that before, but it left all the squishy balls in the bottom of the washer. Actually? Freshly laudered reconstituted alpaca? No so bad. Mountain fresh. I’ve had this experience, but with slightly less confidence in my dryer. And the smell…. ACK! Glad you learned that, and not me. 🙂 Good job on the husband training. My mil trained my hubby well, and I’ll be eterally grateful. It seems my son, at age 18, still does not know how to empty his pockets of pens, pencils, and his wallet. He seems to be in the money-laundering business, and has a clean driving record. It was like a water into wine miracle only it was squishy Pull Up balls into an fluffy alpaca. All the wet squishy balls went into the dryer all over all the clothes and then gathered together in the lint trap for the rapture where a great transformation took place. A zillion little dots of squish exploded into one small alpaca. I swear. I wish I’d take a picture of this fluffy blanket of reconstituted squish that came out of the lint trap. I’ve washed disposable diapers. Such a mess. This has happened to me more than once and every time they all dry up and come off in the dryer thank goodness. I have yet to experience trying to clean them up outside of the dryer. My second boy my give me that opportunity some day though. I literally find rocks in the bottom of my washing machine on a regular basis. At least they’re clean rocks by that point, but it’s a miracle my washing machine hasn’t been seriously injured in the process. Mmmm…I worked in daycare and when a diaper explodes you can NEVER get that inside-the-diaper stuff to go away!! Oh my! Yes, I’m very familiar with the “diaper balls” as I call them. Have to say I’ve never WASHED a diaper, but then again, in the past couple of weeks I’ve washed: a pair of reading glasses, a sharpie marker (which, only by the grace of God did not ruin any clothes or laundry appliances), a $1 bill (which went promptly into the piggy bank I keep in my laundry room for just such circumstances), a tiny lego Batman cape, a Playmobil man, a blue Rockenbok ball and an ATM card. Sigh. The perils of living with males. Something similar happened in our household, but it involved pocket Kleenex shoved in to a pants pocket. People with Y chromosomes can’t help it, I think. They got skipped for the laundry gene. Have you ever seen a Y chromosone-ous person hang up wet laundry to dry????? So it worked? I was expecting something disastrous to be melted to all of your clothes! Not too long ago one of my sons was standing at the top of the stairs. He bombed another of my sons with yet another son’s very wet diaper. The result was an explosion of stinky wet blobs all over my stairs. The moral of this story is that you should never vacuum up the innards of a wet diaper. Because the smell stays in your vacuum and comes out whenever you use it. Blech. Oh, funny, funny stuff! I’ve encountered the squishy stuff in the diapers before too. Not good. Not good at all! Sean sounds like he’s doing pretty good in his Husbandry 101 classes. I’m impressed! Oh my, I feel your pain. I had to pick those squishy little balls from a ripped wet diaper out of our old shag carpet. Makes you want to say all those words we don’t use at our house! New house, new carpet, no more diapers, thank goodness!